Lateral thinking is a thinking concept that was introduced by Edward De Bono more than 30 years. It is a supplement to the traditional analytical sequential thinking. Both are needed, and lateral thinking brings creativity and new concepts into the process when the analytical thinking has led us into a dead end. Becoming skillful in lateral thinking requires practice. Lateral thinking forces us away from patterns that have deep grooves in all of us, and we all know that such behavioral grooves are very difficult to get out of. Ideations Problem Formulator, a technique that was added to TRIZ to help develop a clear view of the exact nature of the problem that must be solved, can help us here. There is a clear link between TRIZ, and then specially the Problem Formulator, and Lateral thinking. Generally the Problem Formulator provides means to achieve ESCAPE and PROVOCATION by generating suggestions for lines of solutions. ESCAPE and PROVOCATION are the two basic processes of Lateral Thinking. These terms are explained in De Bonos book: Lateral Thinking for Management, Chapter 4. Problem Formulator lists several Escape-ideas (searches for alternative ways to look at the problem). "Provocation" is provided by looking more deeply into the suggested escape-routes, even if they seem impossible and useless. One of the most important chapters in Edward De Bonos book "Lateral Thinking for Management" is "Changing ideas by avoidance". This chapter deals with the techniques of avoiding dominating ideas. Lateral thinking is not specifically concerned with problem analysis, nor is it concerned with proving an idea to be inadequate. Lateral thinking is concerned with moving on to a different idea. The aim is to generate different ideas and to escape from the old ones. The approach in problem solving that most of us are trained to do is to find the core of the problem and focus attention on this. Thus we run the risk of overlooking hidden solutions that would appear if the problem system was considered from another angle. Lateral thinking teaches us to look at the problem from new angles to get away from patterning. In most cases of day-to-day problem solving the problem is too simply expressed. Using de Bonos technique of changing entry point makes it necessary to set up a chain of problem statements. Thus it becomes easy to enter the chain of problems at any link in the chain. Using the Problem Formulator, this comes automatically. Triz always includes at least one useful effect and one harmful effect (problem) in the link. Having the useful effect into the chain is an improvement relative de Bonos technique. Figure 1. The conventions of the Problem Formulator are that green arrows show beneficial effects and red arrows show harmful effects. Example: Causes of traffic congestion. A very simple example from the chapter in De Bonos book is how city planners in London tried to solve the problem of traffic congestion in London by using street parked cars as the only entry point. They ended up with regulations that required each new office building to have adequate park facilities attached to it. Later on they were forced to shift their entry point to cars moving in and out of London. From this entry point, it was obvious that providing every new building with car park would only increase the problem by encouraging people to go by car to work. So the regulations were changed again. Seems very obvious, but it takes at least a small amount of creativity. If the city planners had been using the problem formulator at least they would have been able to establish the above graph. This graph leads to several new entry points, they will all come out of the problem formulator list. 1. Find a way to eliminate, reduce or prevent (Traffic congestion), under the condition of (Street parked cars) and (Traffic moving in and out of city). 2. Find a way to benefit from (Traffic congestion). 3. Find a way to eliminate, reduce or prevent (Street parked cars), under the condition of (Traffic moving in and out of city). 4. Find a way to benefit from (Street parked cars). 5. Find a way to eliminate, reduce prevent (Traffic moving in and out of city), under the condition of (Going to work). 6. Find a way to benefit from (Traffic moving in and out of city). 7. Find an alternative way to provide (Going to work), which provides or enhances (Work is done), and doesn't cause (Traffic moving in and out of city). 8. Find a way to enhance (Going to work). 9. Find a way to resolve CONTRADICTION: (Going to work) should be for providing (Work is done), and should not be for not causing (Traffic moving in and out of city). 10. Find an alternative way to provide (Work is done), which doesn't require (Going to work). 11. Find a way to enhance (Work is done). One of the alternative approaches, though useless in itself, can trigger a new approach. By generating alternatives, one becomes more ready to appreciate and understand differing viewpoints of others. But De Bono teaches no obvious technique to set up the new entry points or how to find the various alternatives in the Quota of alternatives. What could be more suitable for this than the list of suggestions generated by the Ideation Problem Formulator? The formulator is not shy and will suggest event the most provocative alternatives that very few would have dared to suggest even in a brain storming session! "Consider the problem of a business which requires highly trained operators (for instance telephone operators). After an extensive training during which they do not do much work but are paid a salary, the operators leave with their new qualifications and find more lucrative work with a business that has paid nothing toward their training." The Problem Formulator also generates possible solution paths. They are shown on the next page together with De Bonos suggested solutions from using lateral thinking. It is remarkable to see the clear connection between the suggestions coming out of the Problem Formulator and the suggested solutions from De Bono. The Problem Formulator covers them all, but not as specific as De Bono. This is because the Problem Formulator provides suggestions for new points of entry. 1. Find an alternative way to provide (World class operation of system), which doesn't require (Highly skilled operators). 2. Find a way to enhance (World class operation of system). 3. Find an alternative way to provide (Highly skilled operators), which provides or enhances (World class operation of system), and doesn't require (Increasing operator qualifications). 4. Find a way to enhance (Highly skilled operators). 5. Find an alternative way to provide (Increasing operator qualifications), which provides or enhances (Highly skilled operators), but doesn't cause (Operators become attractive to other companies), and doesn't require (Training of operators). 6. Find a way to enhance (Increasing operator qualifications). 7. Find a way to resolve CONTRADICTION: (Increasing operator qualifications) should be for providing (Highly skilled operators), and should not be for not causing (Operators become attractive to other companies). 8. Find an alternative way to provide (Training of operators), which provides or enhances (Increasing operator qualifications), and doesn't cause (Operators not working while being trained). 9. Find a way to enhance (Training of operators). 10. Find a way to resolve CONTRADICTION: (Training of operators) should be for providing (Increasing operator qualifications), and should not be for not causing (Operators not working while being trained). 11. Find a way to eliminate, reduce or prevent (Operators not working while being trained), under the condition of (Training of operators). 12. Find a way to benefit from (Operators not working while being trained). 13. Find a way to eliminate, reduce or prevent (Training is expensive), under the condition of (Operators not working while being trained). 14. Find a way to benefit from (Training is expensive). 15. Find a way to eliminate, reduce or prevent (Operators become attractive to other companies), under the condition of (Increasing operator qualifications). 16. Find a way to benefit from (Operators become attractive to other companies). 17. 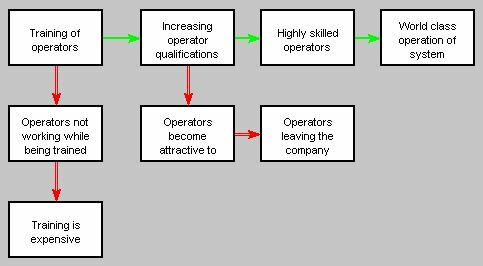 Find a way to eliminate, reduce or prevent (Operators leaving the company), under the condition of (Operators become attractive to other companies). 18. Find a way to benefit from (Operators leaving the company). A: Take only trained people, do not train at all. B: Subsidize job training in this field as part of general education having nothing to do with business itself. Or provide a direct educational service. The operator "Isolation" leads us to De Bonos alternative D and the operator "vaccination" leads us to De Bonos alternative F.
Lateral thinking is not an easy subject. It requires training and insight. Ideations Problem Formulator is probably the best tool one can find to automatically generate the food for thought that Lateral thinking thrives on. About the author: By education I am a MSc in electronics engineering with 15 years of experience in managing R& D. I am Managing Director of Nordak Innovatikk as, a company consulting in systematic innovation with emphasis on TRIZ. The company is the Scandinavian representative of Ideation International Inc.